NB: If you wanna keep saved data you have to unzip the game. 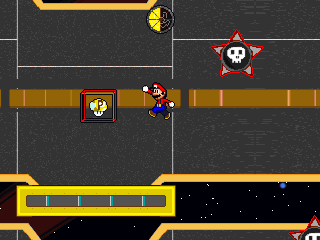 A sequel to Super Mario Fangame, with Mario Galaxy theme. I tried not making it so hard this time. 4 Bosses and 25 stars to collect. Before I move on to the next project, I wanted to update this one, fixing some problems and also add some effects and some few other things. Hey LOVE the game and FIRST TO DOWNLOAD!!!! You might know me as CDPlayer0 on youtube!!! AWSOME GAME!!! although i am having trouble finding the secret stars of platform galaxy and ever night galaxy does anyone know where they are? Wow, cool. I'll check it out! hey how come i can't see this game inside the game library in the side bar? Because the game is still queued. Anyway, the game is pretty cool. Hey! I saw this on YouTube! Can't wait to play it! EDIT: Wow... It was a bit of a let down from what I was expecting, but it was still a great game! I liked the original Super Mario Fangame, I hope this sequel doesn't prove disappointing because you felt a need to dumb it down. does anyone know where the secret star of platform galaxy and ever night galaxy is? Myuu: I tried to making it easy to reach Bowser, but hard to get all stars. Sedowood: I sent you a PM. All the levels I've played so far felt dumbed down, but it probably wouldn't have been as painful if this game didn't lag on my computer, so I'm not really qualified to review it, though I would give it a 4. I liked Super Mario Fangame and Yoshi's Adventure MUCH better. Nice engine, though. This game is EPIC!Nice gravity you've got there! Simple put, it has a few flaws, and a few good things to mention too. The control is very confusing. You can't map two actions to the same button (which is very silly, I don't need two separate buttons for jumping and confirmation) and the character's movement is just.... very wrong. In the original game, your character moves whatever the direction the player sees. So if Mario or Luigi is sideways, the player will have to use up and down to move him. Instead, the player needs to enter the relative direction - which is more confusing when this does not apply when the character is upside-down. Then comes to the frustration. For example, I found one of the stages difficult enough in itself already, buy right after that? I was offered a chance to beat it again without any enemy kill? It's asking for the near-impossible! The difficulty curve gets a lot steeper by the time you have 6~7 stars or something. Not to mention the second boss is almost impossible to time. I may not be a good player, but at least pleeeease let me win after 3 or 4 attempts, no? There's also one problem about this game's programming. Now, I see that the author didn't make everything, and there is a framework to work around. So if it's not your fault, blame whoever made the IDE... it's called "Multimedia Fusion" eh? The planetoids are all squarey, this is strange, yes. But not as starange as how you move relatively backward when jumping on a moving platform. This simply is not expected in a Mario game - or in real life physics either. And the whole walk backward/sideways thing simply is not mainstream in Galaxy - and it's for a good reason. And I would like to see more flexible user interface, like an actual pause menu and support for widescreen. Oh, and finally, there are two things I don't like - but it's just me. Those are not faults. One: background music: Why M&L? Two: death count. They're just there, silently telling players how unskilled they are. First off, the graphics. They aren't too superior in terms of graphic quality, but they do very well. Special effects are shown properly. Now if DirectDraw can be applied or even adopting vector graphics.... bah. I'm asking for too much. Then comes the sound effects. They're used in the right places in most times (except possibly the SSBM/SSBB Lip's Stick effect for grabbing coins). And the saving warning screen is ABSOLUTELY welcome here. Now wait.... before I see anyone asking me to write a review instead.... I haven't beat it yet, and thus I can't safely say I played it well enough to give formal comments. I think some of you expect abit too much. I tried many differnt control setups for the gravity directions and I think this was the best way. Also you don't need every star to beat Bowser. It's hard for those who want it hard, that was my idea. Because reviews from previous games says they are too hard. I didn't get the backwards movement on moving platform part, are you talking about a bug? Explain. EDIT: Oh. and the Star on The Doomship fleet Comet challenge is where the climbing pole was, so it's not far away from start. BTW: I'm not angry or anything, it's a good thing that people tells me what I should fix. You don't move exactly "backwards". What I was talking about is that you jump straight up, not moving along the moving platform. This is unrealistic in both the mushroom world (see games like Galaxy and New SMB) and our world. Ah, you mean gaining same speed as the platform when jumping off? I do agree with you, I'll see if I can find a way to do it. NVM I found out how to beat him. But he was unusually hard! so you mean when you jump while on a moving platform, you still follow above it? If so, you can do that in both galaxy and nsmb. There's this option you can do for telling about mfgg's games, and it's called a review? but if he could do that, why not review? The hardest mission was beating that Ice Peak mountain with 70 jumps. Great game! I like the final boss battle. YoungLink, it would have been a better idea to either wait until you beat it and submit a review, or just submit a review regardless of beating it. Before I play it... errrrrr... is this a full screen game...?